Michael Duffy was also on target as Vinny Perth’s side edge out UCD. Hoban celebrates his goal from the penalty spot. 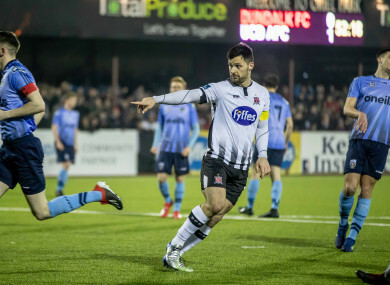 PATRICK HOBAN KEPT his cool from the penalty spot to ease the tension at Oriel Park before Michael Duffy completed the turnaround, as Dundalk came from behind to claim their first win of the 2019 SSE Airtricity League Premier Division against UCD. Dundalk head coach Vinny Perth made three changes to his team from Friday night’s draw at Finn Harps, as Daniel Cleary, Jordan Flores and Daniel Kelly came in to replace Brian Gartland, Dean Jarvis and John Mountney. While Perth had perhaps one eye on this weekend’s clash with high-flying Shamrock Rovers, his counterpart Collie O’Neill kept UCD’s disruption to a minimum as he made just one switch to their lineup. Paul Doyle replaced Kevin Coffey from the loss to Bohemians. Dundalk should have been in front inside three minutes when Hoban – wearing the captain’s armband in Gartland’s absence – controlled the ball well in the box and struck a shot that Conor Kearns did well to push away from danger. After Kelly’s strong penalty claim was denied, UCD almost caught the home side cold on seven minutes when Jason McClelland was put in the clear but Gary Rogers raced from his goal and made a fantastic block in the one-on-one. Past the quarter-hour, Dane Massey received stitches following an aerial collision but as Dundalk spent five minutes with 10 men, UCD could not take advantage. Indeed, it was during that period that Seán Murray threatened but Kearns again was equal to the effort. But the newly-promoted students stunned the reigning champions on 29 minutes when Neil Farrugia burst in on the left of the box and launched a rocket past Rogers. The 19-year-old was a clear threat and it took a brave block from the Dundalk stopper to deny him a second soon after. On 37 minutes, Perth called on Jamie McGrath – who had not featured at all this year due to a groin injury – to replace Flores, who appeared not best pleased with the substitution. Dundalk started the second half with intent and on 53 minutes they had their equaliser. Seán Gannon raided down the right and his cross from the by-line was handled in the box, with Hoban stepping up and coolly slotting in. Seán Murray was in determined mood and his 30-yard strike forced a good save from Kearns. Dundalk were cranking up the pressure and they took the lead on the hour mark when Duffy cut in from the left and placed the ball in the far bottom corner. The three points should have been wrapped up on 77 minutes when Massey’s lofted pass found Duffy in space and he squared for Hoban who rattled the crossbar from close range. Kearns produced a magnificent save to deny the Dundalk No9 who had glanced Mountney’s free-kick towards goal, but that late save could not prevent another defeat for UCD, as the title favourites’ eyes turn to their much-anticipated Tallaght test. DUNDALK FC: Gary Rogers, Seán Gannon, Daniel Cleary, Seán Hoare, Dane Massey, Chris Shields, Jordan Flores (Jamie McGrath 37), Daniel Kelly (Cameron Dummigan 87), Seán Murray (John Mountney 61), Michael Duffy, Patrick Hoban (c). UCD AFC: Conor Kearns, Dan Tobin, Liam Scales, Josh Collins, Mark Dignam, Paul Doyle, Gary O’Neill (c), Neil Farrugia, Timmy Molloy (Richie O’Farrell 83), Jason McClelland (Seán McDonald 88), Conor Davis (Yoyo Mahdy 73). Email “Hoban penalty helps Dundalk rally from behind to earn first league win of the season”. Feedback on “Hoban penalty helps Dundalk rally from behind to earn first league win of the season”.